First, my apologies to anyone who has tried to access this blog lately and run into a 404 Error message that begins, “Gnarly, Dude.” I’ve lately changed the address of the blog, and the error message is automatically generated by WordPress when anyone tries to use the old address. As soon as I figure out how to change the error message, I will. Until then, it’s going to be gnarly, Dude. In the meantime, while I work out the technical problems, I thought I’d pass on a link to this clip of the Ross Sisters, doing their 1944 routine from the show Broadway Rhythm, Solid Potato Salad. The song isn’t much, but these three sisters from Texas, who inexplicably changed their names from Vickie, Dixie and Betsy Ross, to Aggie, Maggie and Elmira, do an amazing contortionist routine, with some of the most controlled backbends you’re ever likely to see. It’s not yoga, but it’s interesting, most particularly in what exactly makes it not yoga, and how that might lead us to think about our own practice. 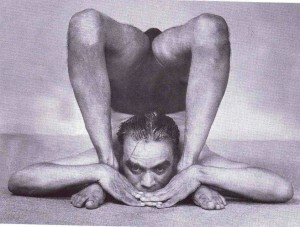 I suspect that most of us get caught up at some point in the more contortionist aspects of yoga poses. It’s somehow satisfying to know that you’re probably the only person in the 4 p.m. Tuesday meeting who regularly kicks up into Pincha Mayurasana (elbow balance) or does headstand. The Ross sisters intended to entertain, and put a great deal of hard physical work into doing it. We intend to quiet our minds, and put a great deal of hard physical work into doing it. Yoga shares a universal physical language with every form of movement from dance to circus acts. In the current yoga climate of North America, it’s also part of a dizzying array of trends including Doggie Yoga and Yoga and Spinning classes. What really makes it yoga? I’d say it’s the intent. What would you say? And if anyone out there is a WordPress wizard, please get in touch. I’m looking for help. Previous post: Pain or golden glow? It matters what you call it.